With the holidays almost over we hope that you had a great summer on the waterways of Europe. In the coming months you can find us on many of the international boat shows this autumn. We will be presenting a lot of exciting news and models - Like the new Grand Sturdy 45.9 Sedan Wheelhouse that has not only has a sublime layout but also has a large forward cabin with French bed, separate shower and toilet, a guest cabin with toilet and a luxurious saloon/galley and steering saloon. 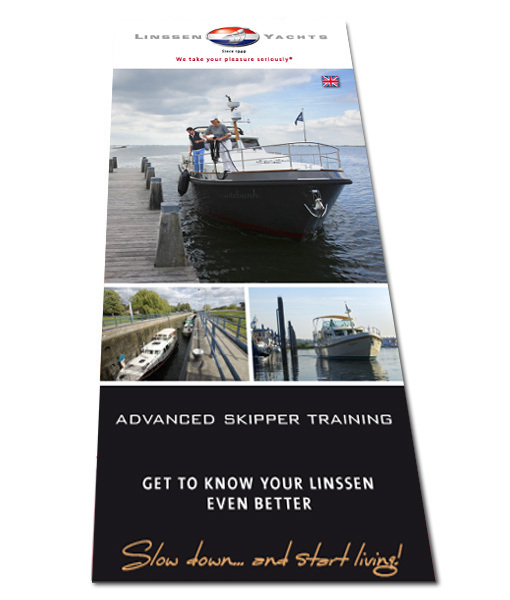 As part of our extended services when handing over your new or pre-owned Linssen, we are offering you advanced skipper training, free of charge and without any obligation. During this training session on your own Linssen, we will teach you the ropes when it comes to safe and relaxing sailing. Visit our website for all advantages of the Advanced Skipper Training. Both at the Hiswa te Water and the Southampton Boat Show that follows a week later, we will be presenting the new brand new Grand Sturdy 45.9 Sedan Wheelhouse. This yacht is aimed at the coastal cruising market but is just a happy in the many inland waterways of Europe. Linssen design and quality at its best.